Cholecystokinin (CCK) is a gastrointestinal and neural peptide hormone with physiological activities at multiple target tissues (Mutt, 1980). These include the classical targets of the gallbladder muscularis smooth muscle and the pancreatic acinar cell (for which this hormone was named “cholecystokinin-pancreozymin”) (Ivy and Oldberg, 1928; Jorpes and Mutt, 1966), as well as smooth muscle and some nerves at multiple levels of the digestive tract, including esophagus, stomach, intestine, and colon (Mutt, 1980). In addition, several potential activities have been described for this hormone at the levels of the brain and spinal cord (Dockray, 1982; Yaksh et al., 1982). 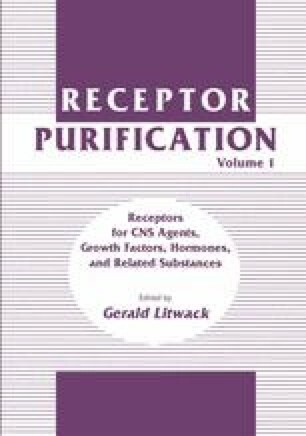 Thus, there are multiple receptor subtypes from which to choose for CCK receptor purification.